Not all goat milk is the same – there are variations in volume, components, water content and butterfat depending on the time of year and on the type of goat breed. 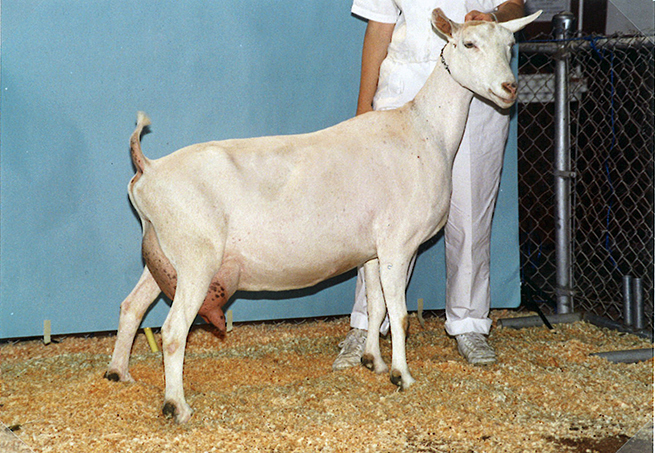 Of all breeds, Alpine and Saanen dairy goats are the top producers by volume. Milk from the Nubian dairy goat breed on the other hand, tends to be a bit higher in butterfat. To make our yogurt, kefir and cheeses consistent and delicious in flavor, we combine goat milk from Redwood Hill Farm and seven other family farms, sourcing milk from La Mancha, Nubian, Alpine, Oberhasli, and Saanen goats. Since the first of the year, we have a newfound and great connection to Switzerland, as Jennifer Bice decided to sell Redwood Hill Farm & Creamery to the Swiss dairy company Emmi. We therefore thought this would be an excellent time to take a closer look into the Swiss Saanen dairy goat breed (Saa·nen): from its origin in the Saanen Valley of Switzerland to its widespread popularity around the world. 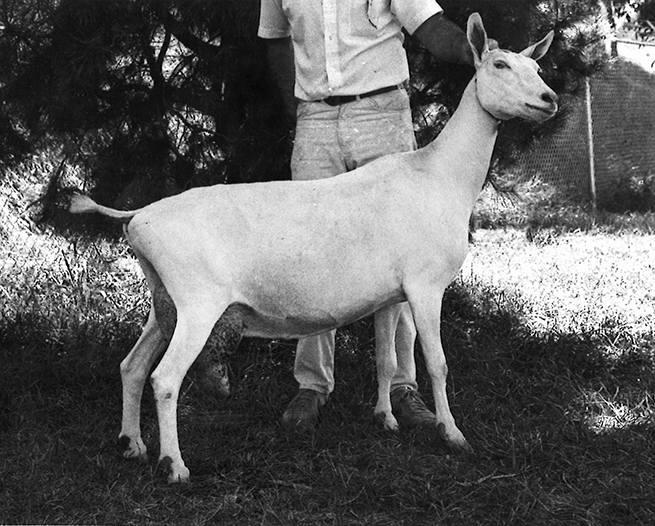 In the process, we found the story coming full circle: The heritage of one beautiful Saanen doe named Jaizy, dating back to the time when Redwood Hill Farm Grade A Goat Dairy was first founded in the 1970s, still lives on in its descendants in the “J” line at the farm today. 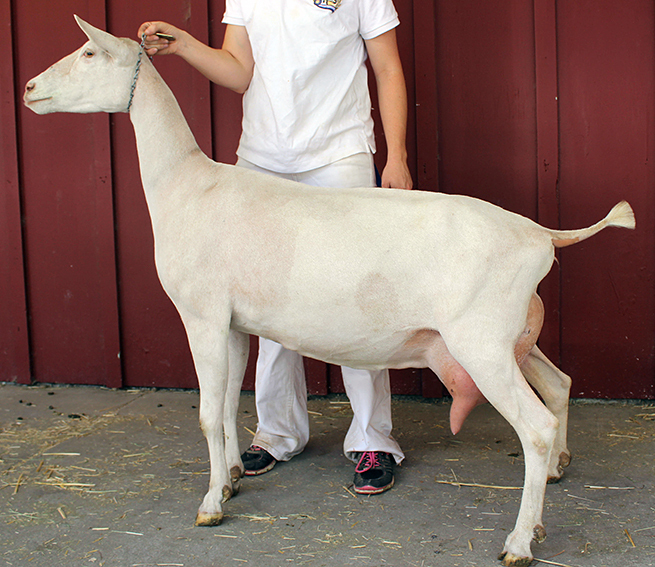 Enjoy this read on the history of the Saanen dairy goat. 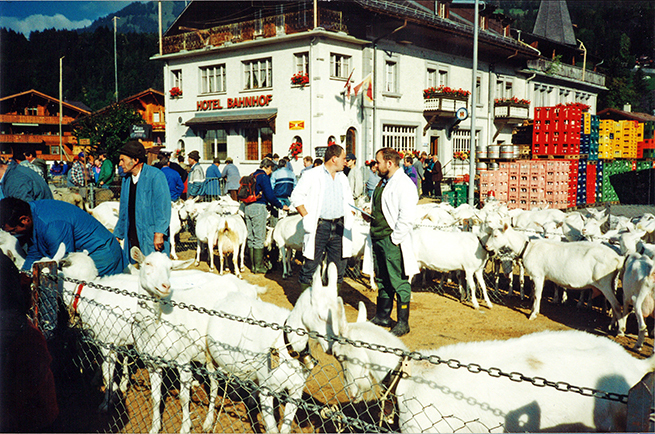 Swiss farmers with their Saanen goats and cheesemaking equipment headed to the high mountain pastures for the summer. 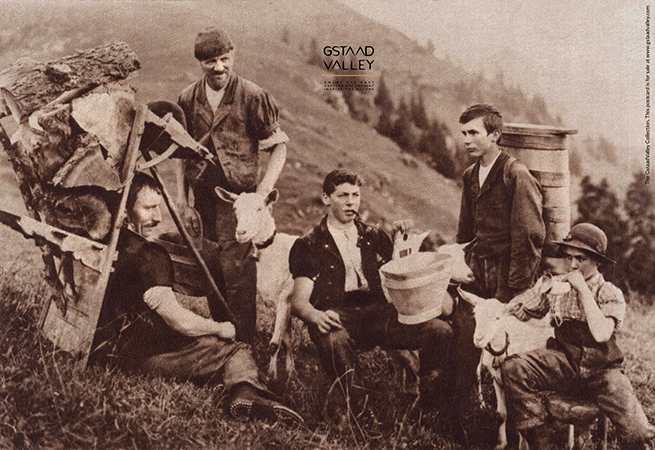 Switzerland is widely considered the cradle of modern goat breeding. Especially the Saanen and Toggenburger goats (in our country called Toggenburg) are world-renowned. Since the beginning of the 20th century, more than 50,000 dairy goats have been exported from Switzerland to countries all over the world. Of the different breeds, the Saanen dairy goat is the most widely distributed dairy goat in the world and is valued for its abundant milk production, hardiness, and calm, sweet nature. 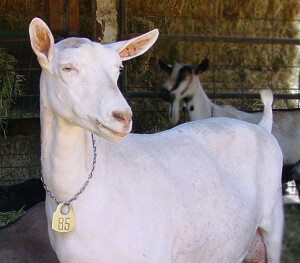 Pure white in color, Saanens are also one of the largest breeds of dairy goats. Due to their high milk production they are often dubbed the “Holsteins” of the dairy goat world. The history of Saanen goats begins in the Saanen Valley, located in the Canton of Bern in the southwest of Switzerland, where the breed was developed. Saanens first came to North America in 1904 when approximately 160 goats arrived by way of Canada over a period of about 18 years. Swiss Saanen dairy goats are appraised annually after returning to the valley for the winter from their summer feeding pastures. Only a small percentage of those first arrivals were of a quality that would go on to benefit the breed as we know it today. This included strong feet and pasterns and well-supported udders. Descendants of the few exceptional individuals formed the nucleus of our present-day Saanens in the U.S., some of which made their way to California and the East Coast. Redwood Hill Farm first began to breed Saanens in 1970. Much of the early success of Redwood Hill Farm’s young breeding program was credited to a small handful of Saanens, including a pretty Saanen doe named GCH Redwood Hills Jaizy 3*M. The genetics of that special Saanen doe Jaizy produced outstanding kids. 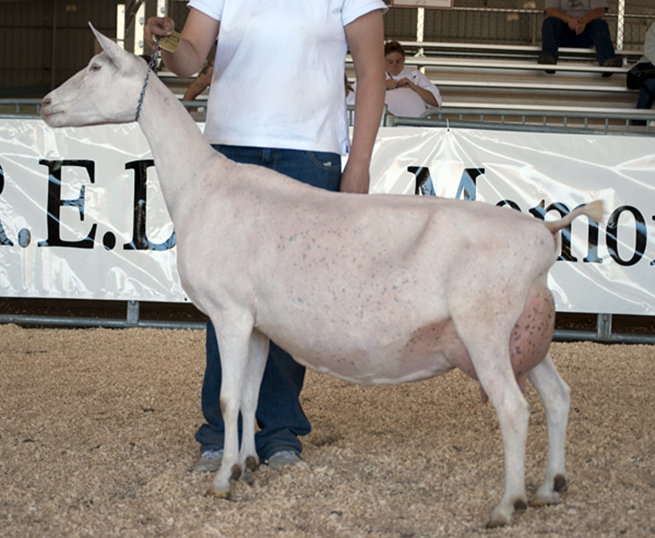 Over the next four decades at Redwood Hill Farm, Jaizy’s offspring would go on, year after year, to be great examples of the breed in areas of butterfat components, milk quality and general appearance or “type”—including many permanent champions and two American Dairy Goat Association (ADGA) Reserve National Champions. With a naming system that includes matching the first letter in the name of a kid with their mother, Jaizy’s line of offspring became known at Redwood Hill Farm as the “J” line. Exceptional individuals included champions Reason Jezebel, Jaison Jasmine, Katsuo Jordan, Clinton Jewel and Foxy Jem. Redwood Hill Farm’s Founder Jennifer Bice with SGCH Companeros Foxy Jem 10*M.
At Redwood Hill Farm, Saanens hold a very special place in our hearts. These gentle giants have contributed to our farm and creamery’s history and success in so many ways, not the least of which is the joy of working daily with such sweet and lovely dairy goats. For anyone interested in seeing the full names, pedigree and production information for Jaizy and her “J” line of offspring, click here (http://adgagenetics.org/GoatDetail.aspx?RegNumber=S001706828) . 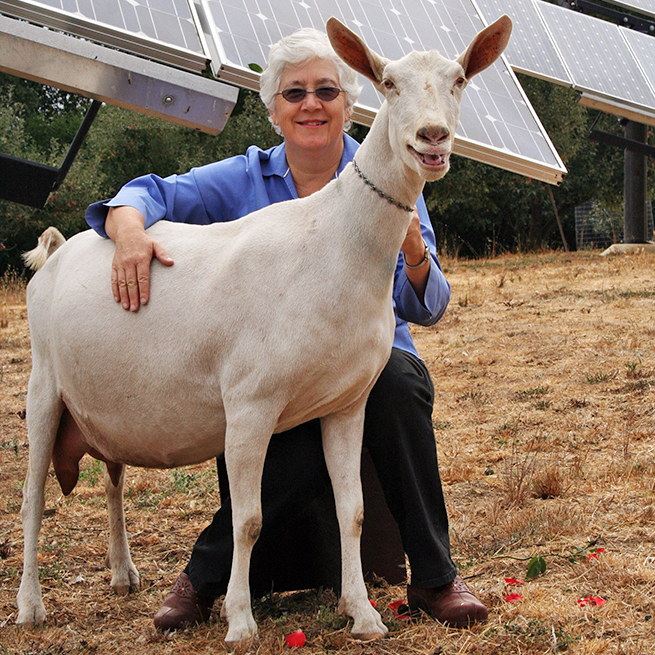 Honoring Redwood Hills Zimba What Makes an Award-Winning Dairy Goat?